Some 150 delegates from nearly twenty countries will participate in the Seventh Asia-Pacific Regional Meeting of Solidarity with Cuba (Erapsc), to be held on September 8 and 9 in Beijing, organizers said. 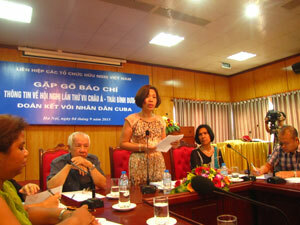 Details of the meeting were specified in a press conference by Nguyen Thi Hoang Van, vice president of the Union of Friendship Organizations of Vietnam, who highlighted the contribution of the Caribbean country to the struggle of the peoples of the world for peace, independence and social progress. Through this event the people of Vietnam wishes to express its unwavering support to Cuba in its just struggle for development, she said. She further stressed that the meeting takes place at a very important moment in the relations between the two countries, which reach 55 years next December 2nd. She said that the objective of the meeting is to call all progressive people to raise their voice and express solidarity with the Cuban people to put an end to the United States blockade against the Caribbean nation. We also intend to strengthen relations between friendship organizations in the region, she added. At this meeting the island will be represented by the Hero of the Republic of Cuba Antonio Guerrero, one of the five fighters against terrorism who was imprisoned in the United States, the president of the Cuban Institute of Friendship with the Peoples (ICAP), Kenia Serrano, and vice president of that organization Alicia Corredera.